Oceanfront data is the most complete meaning there has typically been at least one sale per quarter. 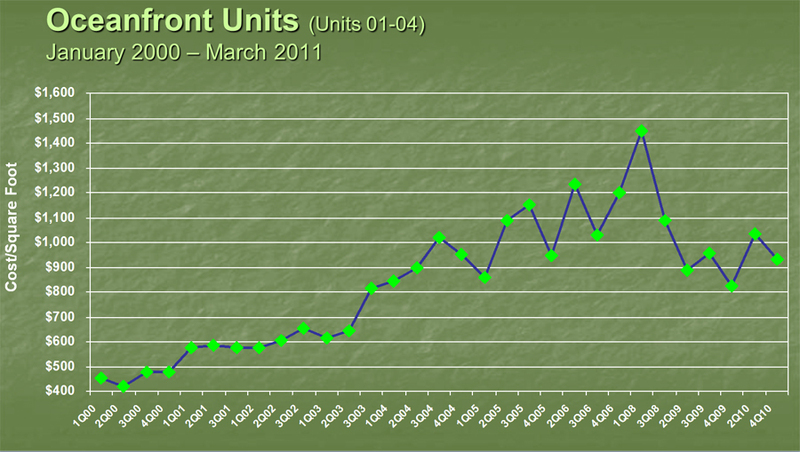 Since January 2000 prices moved from the $400s/sft to ~$1,000/sft today for a renovated unit. The up and down in price seen from 1Q08's highpoint (ultra-renovated double unit) to the low in 4Q09 (well-bought auction) demonstrate the effects abnormal sales can have. Smaller swings are the result of micro-market dymanics, unit condition and sometimes the slight added bump from a combo unit. One of the reasons this group appears to have fallen the most is because during the boom/bubble, prices grew the most. As has been seen in many mainland markets, those that rose fastest, fell furthest. One odd trend emerging in 2009-2010 has been the equality in sale prices between larger 01 and 04 units and their slightly smaller 02 neighbors. The added 100+ square feet doesn't appear to be translating to higher sale prices per square foot.